A painting by Bettye Reagan, a local artist in Central Florida, inspired by a photograph of Michael Dinda, Sr. (1863-1935) and his twin sons, Michael Jacob Dinda, Jr. (1895-1978) and John Paul Dinda (1895-1968) hauling logs in Slavia, Florida, around 1915. Dinda was one of the founders of both Slavia and of St. Luke's Lutheran Church. Dinda moved his family to the area in 1913. During this time, John Dinda was visiting from college. He also began teaching at the Holy Trinity Slovak Lutheran Church in Cleveland, Ohio, in 1915. Original painting: Reagan, Bettye. Dinda Family Hauling Logs. 2001: Private Collection of Bettye Reagan. Digital reproduction of original painting: Reagan, Bettye. 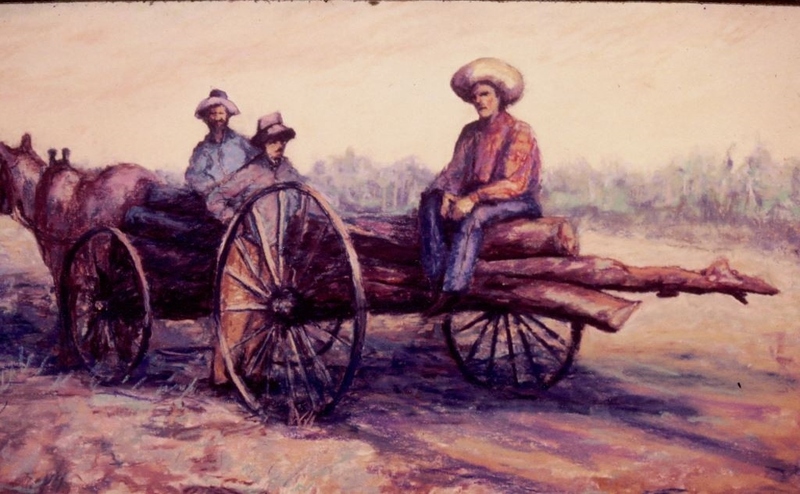 Dinda Family Hauling Logs. 2001. "Michael Dinda, Sr., Michael Dinda, Jr., and John Dinda." RICHES of Central Florida. https://richesmi.cah.ucf.edu/omeka2/items/show/6355. Robison, Jim. "Central Europeans Were Dirt Poor But Toiled For A Better Life In Slavia." The Orlando Sentinel, July 4, 1993. http://articles.orlandosentinel.com/1993-07-04/news/9307020414_1_turpentine-slavia-dinda. "Teacher John Dinda, son of Michael Dinda, Sr.." Central Florida Memory. http://digital.library.ucf.edu/cdm/ref/collection/CFM/id/152823. "Slavia Historical Trail." Steve Rajtar. http://www.geocities.ws/krdvry/hikeplans/slavia/planslavia.html. Reagan, Bettye Jean Aulin. 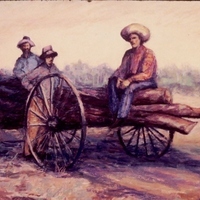 “Dinda Family Hauling Logs by Bettye Reagan.” RICHES of Central Florida accessed April 24, 2019, https://richesmi.cah.ucf.edu/omeka/items/show/6933.